The photos of Michael Phelps at the Rio Olympic games and his mysterious circular bruises caused a huge spike in interest about a therapy called cupping. But what exactly is this mysterious bodywork technique? Cupping is a tool dating back several thousand years where suction is applied to the skin (applying negative pressure) using a variety of methods. This suction increases the amount of blood and fl uids being pulled into the area. The circular marks are a result of microtrauma to capillaries. These small traumas stimulate the body to repair the damaged cells and make stronger capillaries, much like working out at the gym does for muscles. The postworkout muscle soreness is caused by damage to muscle fi bers (not lactic acid) and the body responds to the trauma by building more and stronger muscle tissue. Cupping is perhaps best well known in the fi eld of traditional Chinese medicine (TCM). In TCM, the practitioner is trying to stimulate stuck qi (or life force). They intentionally cause those marks to move what they believe to be "stagnant blood," which is ironic since the marks are literally causing stagnant blood to leak into tissue. An aggressive type of cupping using glass cups resulted in the bruises on several Olympic athletes. Cupping expert and massage researcher Samuel Wong says, "While research has yet to conclusively support the practice, therapists who use it say this age-old modality decreases muscle pain, improves lymph fl ow, and can even reduce cellulite." Another style of cupping that is gaining popularity is Soma Cupping—a system I developed. Soma Cupping uses soft silicone massage cups to apply the same negative pressure with a different intent than TCM. With Soma Cupping, we are trying to bathe the muscles and tissue with fl uids, but not necessarily cause discoloration or bruises (though occasionally marks can form). Stubborn trigger points (tender spots) can be relieved by placing a massage cup on irritated muscles for just a few seconds; massage cups can also be used for structural alignment work an advanced practitioner. Whether your practitioner uses glass or silicone cups, it's important that they are educated in, and comfortable delivering, the work. It's a very powerful and affordable modality that can be effective for a wide range of conditions. 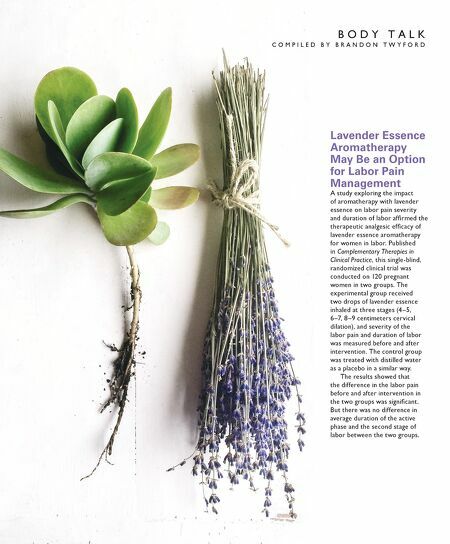 B S Gregory Gorey is a licensed massage therapist since 1995, published author, and creator of Soma Cupping. In 2012, he began creating free massage tutorials on YouTube that have generated more than 60 million views. 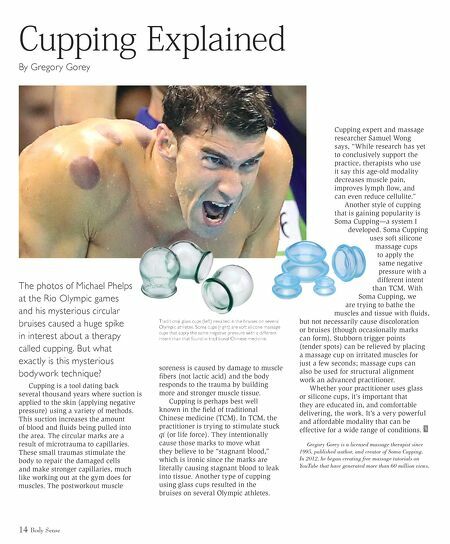 Cupping Explained By Gregory Gorey 14 Body Sense The photos of Michael Phelps Traditional glass cups (left) resulted in the bruises on several Olympic athletes. Soma cups (right) are soft silicone massage cups that apply the same negative pressure with a different intent than that found in traditional Chinese medicine.